Our experienced cosmetic dentist may recommend dental bridges in Little Rock, AR, if your tooth can’t be salvaged with a filling or crown, but you still desire a fully functioning tooth. A bridge also prevents your remaining teeth from moving out of position, which can lead to other unwanted dental issues. In addition, a dental bridge enhances your ability to speak and chew normally. If you have a missing tooth, our cosmetic dentist can replace the gap with a dental bridge. Getting a bridge usually requires two appointments. Our expert cosmetic dentist in Little Rock crafts a mold of your teeth and prepares the surrounding anchor teeth for permanent crowns. A dental laboratory takes around two weeks to create your bridge, followed by a visit to our office for your final fit. Once the process is complete, your bridge will look and act just like your natural teeth – no one will be able to tell you are wearing one! After your bridge is installed, we encourage patients to care for bridges just as they would regular teeth. Daily brushing and flossing is recommended, and is usually the only maintenance necessary. If you experience any pain or discomfort once your bridge is in place, give our friendly office a call right away. Your health and comfort are our top priority! If you are wondering if a bridge is the right solution for your unique dental needs, give us a call at 501.821.4200 or click here. 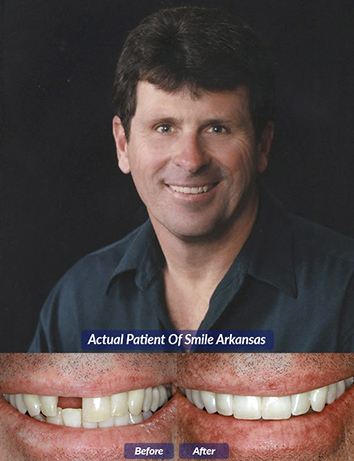 Smile Arkansas also offers dental implant restoration, veneers, dentures, crowns, teeth whitening – and much more! In addition, we invite you to learn your treatment options and take advantage of our complimentary Dr. Wyant Smile Makeover Consultation. If you’re interested in orthodontic treatment, like Invisalign, then please schedule your Dr. Wyant Invisalign Smile Analysis. This appointment includes a comprehensive examination, X-Rays, an in-depth consultation, and a tour of our state-of-the-art office (a $300 value) – yours free! Come experience Smile Arkansas and our 5-star-rated dental bridges in Little Rock, AR. We look forward to helping you with all your dental care needs! As one of the premier dental practices in Arkansas, our team at Smile Arkansas also provides dental bridges to patients from Little Rock, Conway, Bryant, Benton, Cabot, Sherwood, Hot Springs, Hot Springs Village, Pine Bluff, Fayetteville, Bentonville, Rogers, Springdale, Russellville, El Dorado, and Camden, AR.